So, as some of you here know, I took part in the Ludum Dare #31 Compo. That means I had to make a game with a given theme in 48 hours, all art by myself. I made a top-down survival game where you move with right-click and fire with left-click. The challenge comes from moving your mouse quickly in order to run away from enemies while still firing at them. The downloads can be found on the LD page above. Including the QC source code for curious people. Before the compo I already knew I wanted to use FTEQW for this just because. I also feel like using a Quake based engine would be easiest for myself. 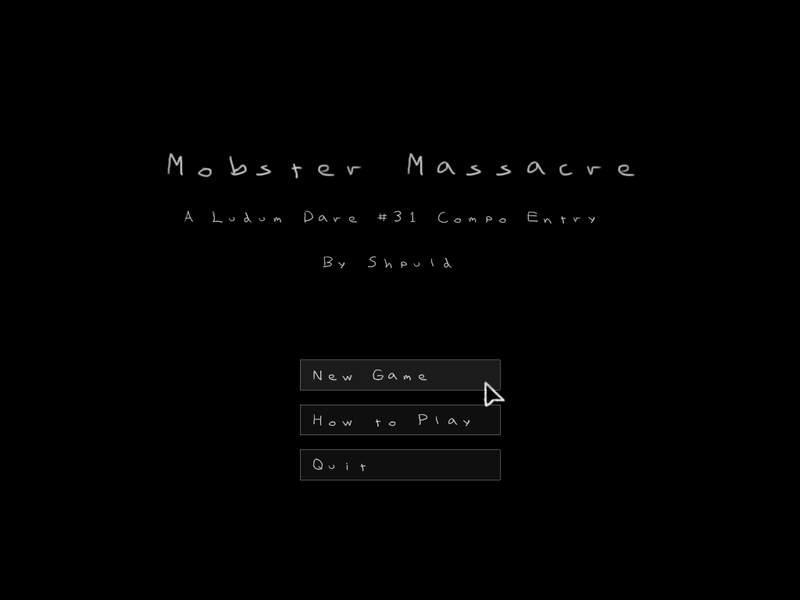 Theme was: Entire game on one screen, so I started with a stationary top-down camera and point and click movement. Originally I thought of making the game start zoomed in and move the camera backwards whenever player progresses in order to reveal more of the area. Later on I decided to make the game a survival game, enemies come in from doorways that you can't go out of, and they hunt you. After some screwing around I started worrying about art and made this player model, it's a dude wearing green camo trousers and a sleeveless Telnyashka. Interesting thing about the player model is that he is constantly aiming where the cursor is pointing, but the legs/lower body is always facing the direction where he is moving. I did this by splitting the player model into upper and lower body, lower body only worries about pointing at move target and blending between run and still animations. Upper body has an animation where he aims as much to the left as possible in the start and as much to the right in the end, so I could have him smoothly aim wherever I wanted him to by changing .frame1time. At this point I was adding more things into the code while at the same time creating more assets; the map, 3d-models, sounds, textures, everything. 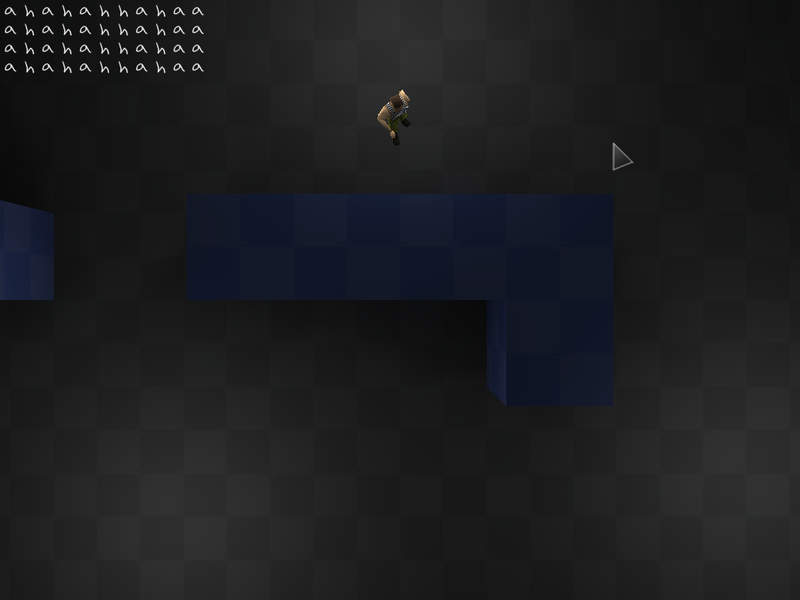 I also cut some corners by making enemies one type only and using the same model as the player, different textures and a bit different animations though. The enemy model isn't split up into upper/lower body either, there was no real need for that. Enemies also don't have real pathfinding at all, they just go to a random path node they can see when they're not chasing a player. 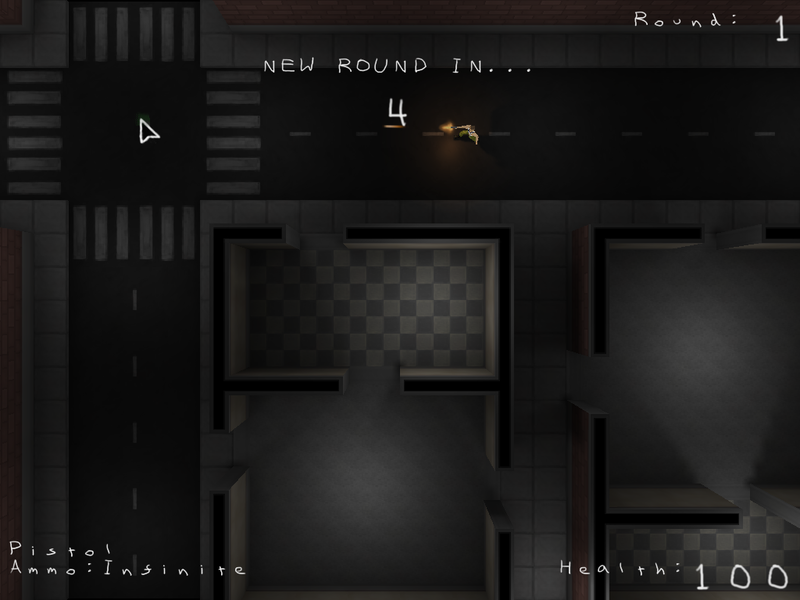 Eventually in a tiny map they'll spot player and start the chase. 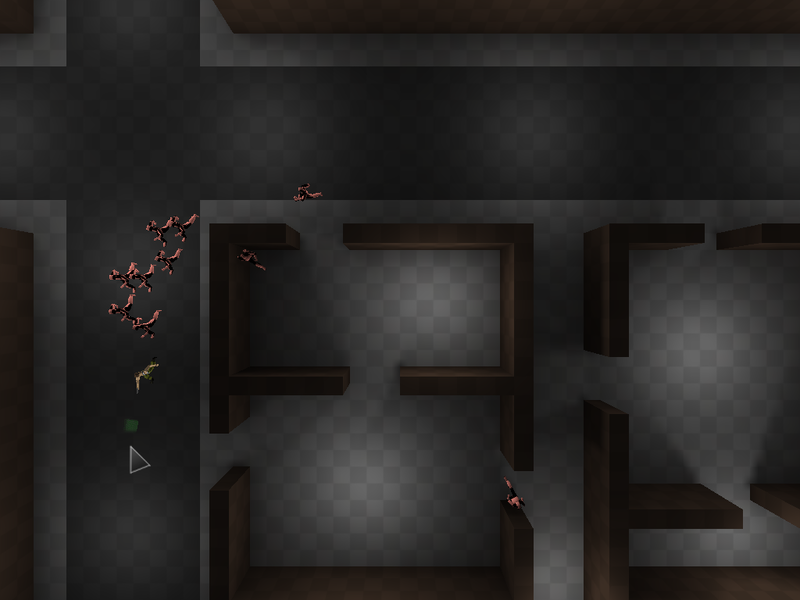 The enemies keep track of a "last seen" for the player, in case they go behind a corner. They'll run to the last seen point and they have a better chance of spotting the player again without too much risks of getting stuck in geometry. In the cases where player manages to get away from an enemy so that they can't see him, they'll go wandering around again. Time was flying and I needed to make the game prettier and playable. I finished the map and made the textures for it. Then I also needed to add more weapons, just having a pistol is crappy, so that meant more modeling and more coding. Both of these were surprisingly fast to do, as well as making the new sounds for them. I also needed the code in the actual round system, after these things the gameplay itself was pretty much finished. Having Quake/UT-style announcer voices also improve the cool-factor. Fun fact: Dying was the last thing I implemented gameplay-wise. Of course, I also needed to revamp the menus. I used my own empty FTEQW project with very minimal menu code in CSQC already. Just had to modify it to suit my needs a bit better. What can I say? All this in 48 h? Awesome! 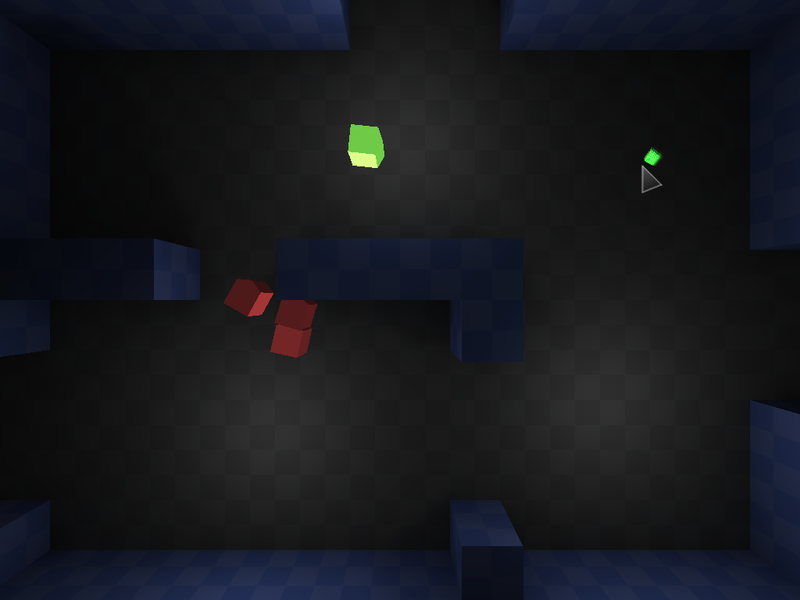 I'll test with In Windows and I let you know, anyway graphics is supercool for a game made in 2 days! And thanks a lot for the gamecode source too! It was long time I waited for someone to rip his csqc menu off! Yeah linux version wasn't properly tested Spike has been doing some fixes to the engine it seems like it so grabbing the latest build might work. Setting up GTKRadiant was basically setting it up for Quake3 and then adding in custom textures and so on, can't remember exactly what else I had to do. Custom entities were just entities that I modified manually in the editor, like spawn an info_player_start and rename it to info_monster_path so my own QC understands it. aye, revision 4798 should fix the linux crash, sorry (would have been crashing even vanilla. oops.). completely my fault. Thanks Shpuld for the clarification. I'm a little worried about the "ghost models" issue that 90% of users seem to have noticed on Ludum Dare game comments section. I'm developing a commercial game and I really would like to use FTE but I'm pretty skeptical about this bug. Let's see if 4798 version fixes even this. Thanks a lot Spike for your ubiquitous and problem-solving presence on the net! EDIT: 4799 SOLVED my crash. Thanks Spike! Models are visible with no problem and I've to say that it's quite addictive! If only had a real mouse, that would have been even more enjoyable. I'll try with my desktop. 1) No death animation and no restart button when you die. 2) There's no need to wandering around. If you stay still is even easier to shoot enemies. Maybe AI needs a little improvement (spawning waves more consistent with the round increasing). But, again, in 2 days it's awesome! toneddu2000 wrote: I'm a little worried about the "ghost models" issue that 90% of users seem to have! That was a bug that was caused by my own shader apparently, fixed it post-release because it's a gamebreaker. I just made the enemies and the player not use my custom shader program. phew, what a relief! Thanks for the update! But, when you tested it on your pc, player and enemies models were visible? Nice little game. Reminds me of a game I made with Games Factory some many years ago. It had a one screen town and then giant worms came there and tried to eat player. I got 40 points. Yea, it was kinda easy to just stand in one spot and just spam the pistol all around. toneddu2000 wrote: phew, what a relief! Thanks for the update! jim wrote: I got 40 points. Yea, it was kinda easy to just stand in one spot and just spam the pistol all around. Do you know if has it been solved? On Windows 7 it works great. Thanks for the source and data (shaders and particles most of all) Shpuld, I'm absorbing so much! I forgot to ask you a thing, Shpuld. I didn't find any license applied to your game source code. Can I use part of it for my personal FTE project under CC0 Public Domain license (crediting you, of course)? Oh yeah I didn't think about what license to attach to this. I think this LD release will be just free to use for whatever you want. I don't care much if you credit me or not.